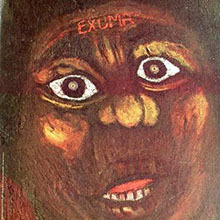 Exuma. While a string of Coventry gigs is the most substantial surviving record of his performance history, this enigmatic Bahamian musician (born Tony McKay on Cat Island) made his bones in the Greenwich Village folk scene of the early 1960s, sharing stages with the likes of Bob Dylan; Peter, Paul and Mary; and Richie Havens. In 1977, Exuma led a cast of 40 at Lincoln Center in a production of “Junkanoo Drums,” a musical that showcased his mystical, voodoo-tinged aesthetic.Before his death in 1997, he would go on to perform at the New Orleans Jazz Festival from 1978 to 1991; open for such diverse acts as Toots and the Maytals, Steppenwolf, Black Flag and X; and receive the British Empire Medal from Queen Elizabeth II. You can find selections from his dozen albums online, but this video produced in the Bahamas is the only sequence available that shows Exuma in action. The Harlots of 42nd Street. New York Dolls frontman David Johansen recalls, “We used to compete with the Harlots of 42nd Street, which was a group of guys who looked like truck drivers but dressed like the Dolls and wore, like, fishnet stockings over these big, muscular, hairy legs. They were my favorite band.” The only known performance footage of The Harlots of 42nd Street is a silent Super8 home movie shot by a young father passing by the Central Park band shell in 1973 — and who years later misidentified the band as the Dolls. He can be forgiven, as you see from the footage below; vocalist Gene Harlot does bear an uncanny resemblance to Johansen himself. Isis would continue in a variety of incarnations through the ’70s, releasing three albums and opening for Blondie on a 1977 East Coast tour. Teenage Lust. Founded by Harold C. Black and Billy Joe White — the core of David Peel‘s original Lower East Side Band in the 1960s — Teenage Lust were glam-rock regulars at Coventry, accompanied by their female support act, the Lustettes. So why isn’t Coventry known as widely as other New York venues of the era, like CBGB? Probably for the same reason so many of its core acts have dropped away; the bills were such a mix of styles, it’s hard to curate a nice, clean narrative for the history books. But one thing’s sure: Choosing five bands that deserve a bigger spot in history was not easy. Check out Rags; Milk & Cookies; the Brats (featuring Rick Rivets); and other bands listed on “Remember That One Time at Coventry?” for a deeper dive into the bands who churned through this joint.